Utilizing Magna-Power’s new patent pending Active Resistance Technology in combination with the company’s internally manufactured microchannel water-cooled heatsinks, the WRx Series addresses high power DC applications where exhaust heat control is essential. The WRx Series greatly increases power density compared air-cooled alternatives. An integrated solenoid controls the flow of water to avoid condensation. Full power can be achieved using conventional water, with water inlet temperatures up to 25 °C. Magna-Power's Active Resistance heat dissipation technology utilizes a switched binary matrix of resistances and MOSFET network, combined with Magna-Power's new MagnaLINK™ distributed DSP architecture, the WRx Series delivers the same features and performance as traditional electronic loads, at a fraction of the price. Beyond voltage, current, resistance, and power control modes, the WRx Series also provides a rheostat control mode, allowing direct control of the product's internal resistance network. To accommodate a variety of DC sources, all WRx Series MagnaLOADs come with several distinct control modes, including: Voltage Mode, Current Mode, Power Mode, Resistance Mode, Shunt Regulator Mode, and Rheostat Mode. Preference for DC regulation is given to the parameter in the selected mode within the programmed set-points. 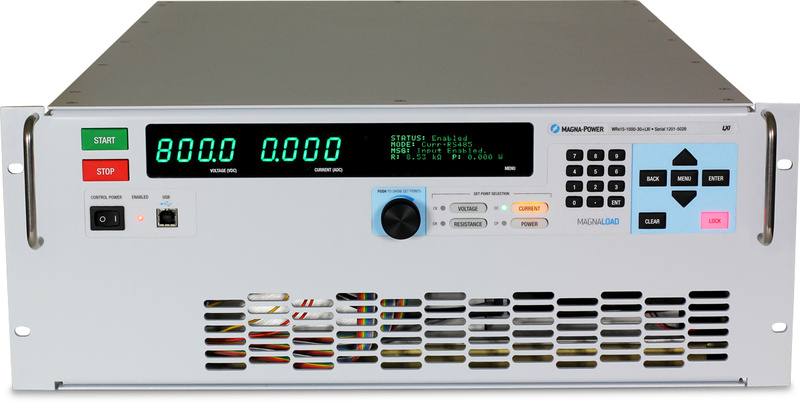 Using the MagnaLOAD's set-points and trip settings, the product can configured to either trip with a fault when a limit is exceeded or to cross-over into a different regulation state. Shunt Regulator Mode turns the MagnaLOAD into a high-speed smart braking resistor, engaging the DC input only when a specified voltage is exceeded by a user-defined percentage, while limiting the shunt current to a programmed set-point. Rheostat Mode, unique to the ARx and WRx Series, bypasses the digital controls to provide direct control of the MagnaLOAD's internal resistor network. Using this mode, true resistance step load response can be achieved without the traditional bandwidth limitations. While the standard operating modes offer 16-bit programming resolution, Rheostat Mode provides 31 different resistor states. All WRx Series MagnaLOADs come with a dedicated National Instruments LabVIEW™ driver, Interchangeable Virtual Instrument (IVI) driver, and support for a wide range of Standard Commands for Programmable Instrumentation (SCPI). These programming interfaces support full control, measurement, and monitoring of the MagnaLOAD. All of the MagnaLOAD's available communication interfaces are supported by these drivers and command sets, including: USB, RS485, LXI TCP/IP Ethernet, and IEEE-488 GPIB. Showcased in the following basic code examples, SCPI commands provide the simplest form of communication by using plain ASCII text and parameters sent over a basic socket connection. Over 50 commands are provided, with detailed documentation in the WRx Series User Manual.